Congratulations to Annika on an amazing 4h 02m 47s – a fantastic PB, especially given the hills and 25 degree temperatures. We love this finish line picture – carrying son Niko the last 150m to the finish line – definitely worthy of a Runners World magazine cover! It’s fantastic to hear how our Clapham Runners are getting on all over the world (we miss you as a regular at training – come back and see us soon!). Annika is a regular blogger on our site, sharing her personal highlights and challenges… and truly capturing the emotion of a triumphant finish line moment. Read Annika’s blog on her training and 2014 race day here…. 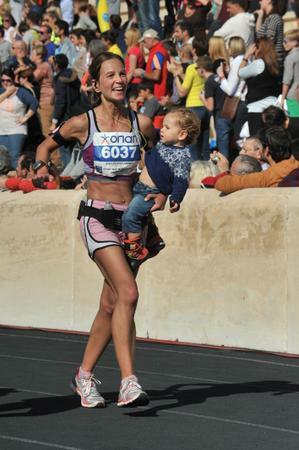 or go back a couple of years and read her past blog on her 2nd Athens Marathon in 2011 here! This year, a new course record was set by Kenyan Felix Kandie (2h 10m 37). The Athens marathon course is of course where it all began – the original marathon being run by a news-bearing foot soldier from ancient Athens, who announced – with his last words – the victory of the Greeks against the Persians during the Marathon Battle in 490 BC. The route follows much of the 2004 marathon route.